In the early 1980s, BBC used to air a comedy sitcom titled "No Place Like Home". There really isn't, is there? Especially, in a sport like Cricket where conditions have a huge impact on the style of play and also the result. No wonder then that of the 41 Test double hundreds scored by Indians, 31 have come within the comforts of the subcontinent. Only 10 have come outside of Asia. Here, we take a look at the 5 Highest Individual scores by Indians outside their home continent. India had been having a fabulous summer in England in 2002. They had famously beaten England in the Natwest Tri-Series Final at Lord's; after having lost the first Test, and drawn the second, they had registered a historic win by an innings under cloudy skies at Leeds to level the series. In the fourth and final Test of the series, however, they were put under immense pressure by a massive 195 by the English captain Michael Vaughn, which took England to a total of 515. 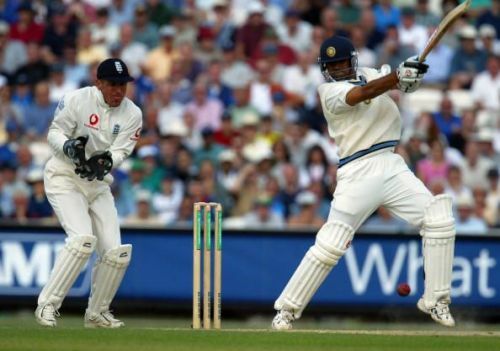 At 18-1, with Sehwag back in the hut, out walked Rahul Dravid- the man of the match in that win at Leeds. Dravid picked up from where he left at Leeds, driving and cutting the Englishmen and in the process putting up 5 consecutive partnerships of 50 or more with Bangar, Tendulkar, Laxman, Ganguly, and Agarkar. By the time they had all fallen India had 465/6 on the board, and Rahul Dravid was 212 not out! India eventually finished only 7 runs short of England's tally, and the match and the series ended in a draw, with rain washing away the final day's play.